UPDATE! The 2016 Hoffman Challenge Fabrics Have Been Posted! Thank you for checking with us, the Challenge collection is expected in mid to late October. Did you notice that both winners are from Colorado?? I have to get on a stick if I am going to live up to their standards! Here are the fabrics for 2016, Crystalia. I must use one of these two in my quilt. These are secondary fabrics you may or may not use, but are recommended. A rough hand sketch. I will use it for the underlay and hand-cut applique pieces for my hand painted fabrics. Here is my sketch for the quilt. Yes, it is very rough, but I got excited when I saw the fabrics! 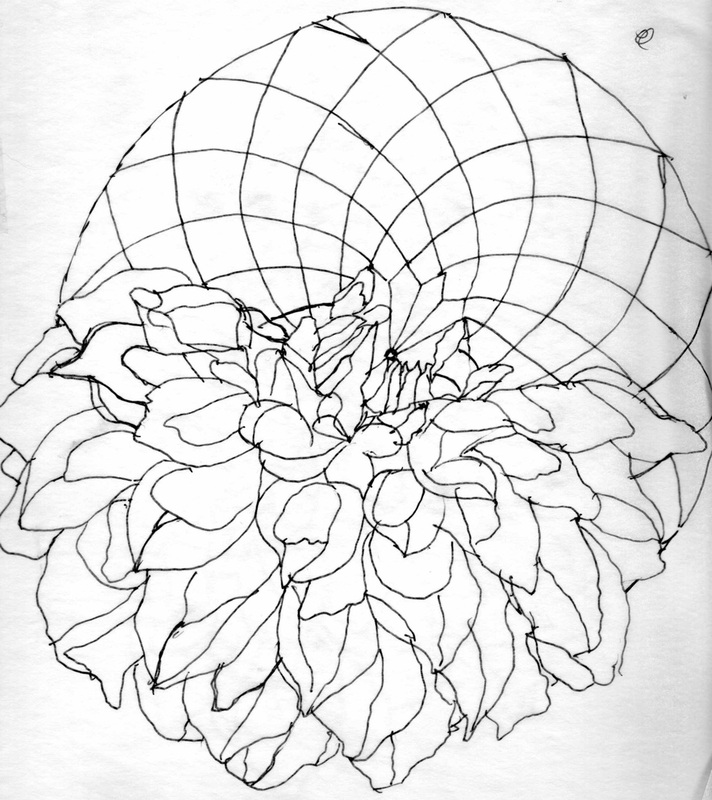 The top part is an old-fashioned “Dahlia” pieced pattern. The lower part is all applique. It pulls the modern feel of today’s hand-painted and dyed quilts, such as the “Best First Time Entry Applique” (see below) (that face painting is amazing). The top part is the original pieced pattern from approximately 1840. Now I can hardly WAIT for the fabric to become available so I can Start! 2009 Hoffman Challenge Quilt. It traveled with the trunk show that year, and was sold to a private party. This quilt is my 2009 Hoffman Challenge Mixed Media runner-up. It traveled all over the United States. 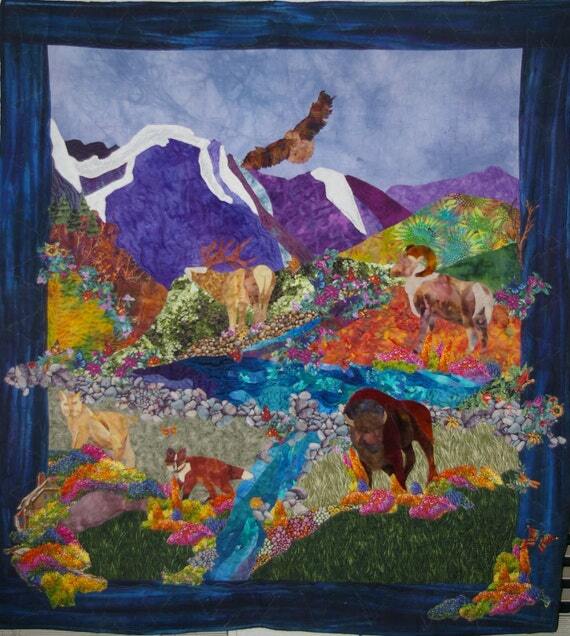 It then went on to be juried into the Quilt Colorado Quilt Show to quite a bit of viewer acclaim. The judges thought my animals were too obvious – well, it IS called “Which is More Beautiful, The Scenery or the Wildlife?” To me, both are breathtaking, and neither overshadows the other. That little cottage down in the left hand corner is everyone’s dream cottage in the mountains. 😉 Beautiful, isn’t it? And I have some older butterfly fabric I can add in as well. The dahlia flower will be mostly my hand painted silks, velvets, and cottons. Whee! I want to get started right away – hand turning and hand sewing all those dahlia petals is going to be, well, “interesting”! Now that I know the colour palette I can start dying silks! I plan to – that way I will HAVE to finish it or be totally embarrassed! ROFL!! my mum was an avid sewer – she loved all things fabric from making dresses and curtains to embroidery. always had something on the go ( oh how I wanted a shop bought dress as a kid!) that talen passed me by though. I’ve done an odd bit of sewing but for me its a chore – but I just love the look and feel of fabrics and those for next years challenge look fantastic. I love the first two especially. Aren’t they gorgeous? I think, mixed with various hand paints and dyes, a few crayons, an ink pen or two, and lots of stitches and beads, it will be a blast! I had the same reaction to 2015 challenge fabric and now the 2016 challenge. I am planning on entering this year after a couple of years of not entering. I have something kind of buzzing around in my head, but the butterflies have not quite landed yet. LOL…I like your design. I wish they would put the fabric out a little sooner. Actually, I love the butterflies . . . don’t forget = you can cut pieces that won’t even look like butterflies when you are done! I can’t wait to get it in my hands. It is a screenprint this year, and we can use either the dark or the light. I am getting a bit of both, plush the kaleidoscope-ish in both light and dark, but not the last two, I don’t think. I don’t really care for those for this particular quilt. I will use a rainbow of hand dyes as well, and see how it cooks!